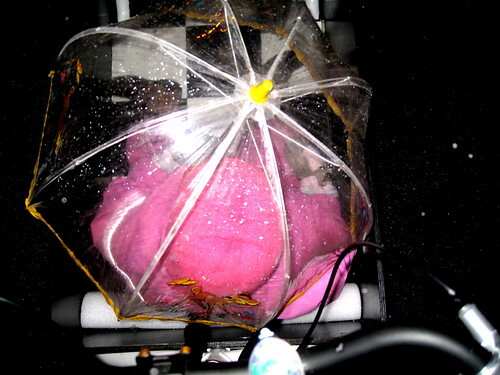 I gave Lulu-Sophia the umbrella not to keep her dry - she has a snow suit for that - but because the wind was whipping the snow along and it was considerably more pleasant for her not to have to squint into the driving snow. It was hard for her to hold the umbrella with her big old mittens, but she managed to hold it in place. 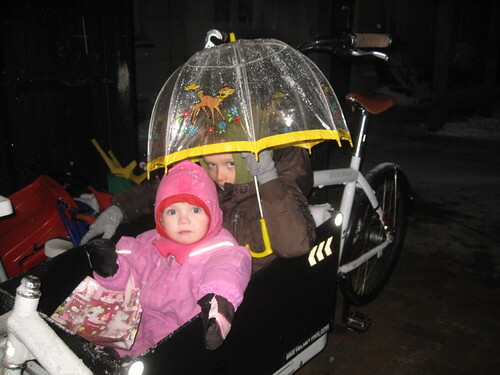 Same thing here, but this time Felix got to act as umbrella holder for Lulu-Sophia on the family Bullitt. Aerial view of The Lulu on her way home from daycare. this is hilarious and adorable! so cool. i'm so bad at biking in cold weather, you're quite a champ. How old is Lulu-Sophia now? I bought my 14 month old daughter a Bullitt for Christmas. she's two and almost a half. she loves sitting there. I can squeeze my wife and daughter in the box for now - they both love it. I'm still thinking about how to put my daughter in there on her own. larry vs harry now have a seat for the box, padded and comfy and that folds up when not in use. complete with a seat belt. perfect for the kids. I first saw the seat after opening the box and pulling out the brochure - doh! Serious question - how low does the temperature have to get to persuade a 2 year old to keep their mittens on and stop throwing them on the floor? They are on strings, but that doesn't stop her trying. Even the past few weeks snow and freezing temperatures is not enough to convince my youngest to keep hers on and prevent the inevitable tears from frozen fingers! my son was the same way when little. impossible. for reasons unbeknownst to me, lulu just sits there with hers on. 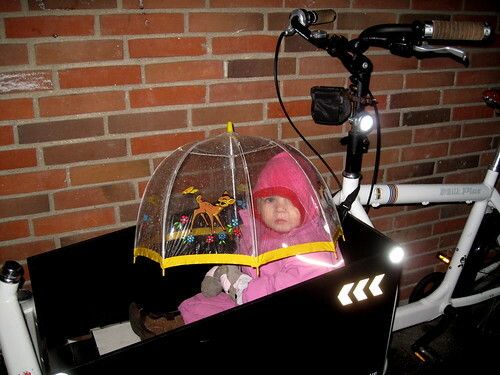 but the number of childrens mittens i see on the bike lanes shows that you're not alone. they just take them off. This picture reminds me of Rotterdam. Where the kids sit in a skip like box mounted on the front of a bike and the parents shuttle them around!